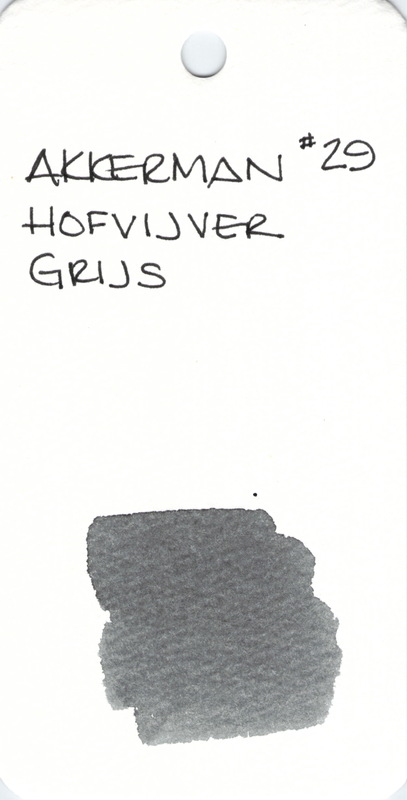 Hofvijver Grijs is a nice middle-of-the-road gray (unless you prefer that it be grey) ink from PW Akkerman. If you’ve been searching for a US source for Akkerman inks and their iconic bottles, check out Vanness Pen Shop. I’ve only ordered from here once, but had a good experience. This entry was posted in INKS and tagged akkerman, fifty shades of grey, gray, grey, ink swab by Christine (Pentulant). Bookmark the permalink. It is much less expensive to purchase directly from Akkerman in the Netherlands, as long as you are willing to purchase 4-5 bottles at a time (including very high shipping costs). Not that I am opposed to purchasing from a US business, however Vanness charges more than double the cost per bottle.